Ahimsa, non-violence in thought, word or deed, is the highest value taught in yoga philosophy. We are meant to practice this value, with mindfulness, in our daily lives. 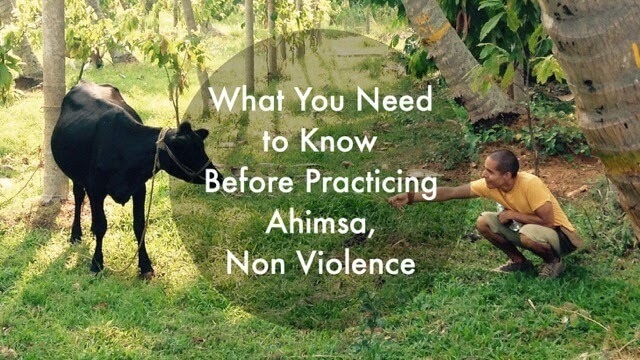 However there is something we need to know before being able to practice ahimsa successfully. Now that I am back in Mysore, since beginning of September, I remembered an incident I had with a cockroach last time I was here. Believe it or not, this cockroach taught me a lesson about love and fear, a lesson we all need to know before practicing ahimsa. It goes like this. One afternoon as I came to the kitchen of my temporary flat in Mysore, to fix myself something to eat, I noticed a little intruder. There was a cockroach right next to the sink. It wasn't a big one. It was just about the size of my thumb nail. Reminding myself of the yogic principle of ahimsa, non violence, I refrained myself from even any desire of hurting this cockroach. But I also believe in saucha, cleanliness. I can't let bugs proliferate in the kitchen. So I decided to gently grab this cockroach and throw it out through the balcony. That might sound not so gentle, but it wouldn't hurt a cockroach, you know. I took a bit of toilet paper to be able to grab it. Well, to be honest I took quite a lot, and not because I didn't want to hurt it but rather because I'm a bit afraid of cockroaches. I slowly approached the cockroach with the toilet paper in my hand, and then gently, with mindfulness, without applying any force I tried to grab it. But I didn't do a very good job. I was not able to hold it with the toilet paper. One of the things that scares me about these bugs is how fast they move. Well, that's exactly what happened. The cockroach quickly escape my grip and started crawling up the toilet paper, rushing towards my hand! It was so quick that it freaked me out. With a very sudden and instinctive reaction, using the same toilet paper I had in my hand, I smashed the poor thing against the sink... a couple of times! I felt so sorry. I had no intention at all to kill it. I had no intention at all to cause it any harm. Yet somehow I couldn't control myself. I know, this might sound like silly story, but trust me, there is a good lesson we can all learn from it. You see, although I had in mind ahimsa, the principle of non-violence, something against my will forced me to be violent. Yes, fear causes violence, and we can see it in so many different situations. Many of us have fear to certain insects and animals like spiders, snakes or rats. We know very well what those fears make us do. But there are many other types of fears. Some fears affects our relationship with ourselves and others. Fear of not being good enough. Fear of being rejected. Fear of being betrayed. Fear of losing what we love. Fear of not getting what we want. What do these fears cause? All sort of relationship issues such as home violence, passive aggressive behaviors, possessiveness, insecurity, infidelity and so on. There are other types of fears with even far greater consequences. Fear of losing power. Fear of being converted to another belief system or religion. Fear of losing our cultural heritage. Fear of losing our identity. What do these fears create? Irrational and catastrophic violence: wars, terrorism, mass murders, and so on. All these violence simply the result of one of the most powerful and harmful emotions of the human race: fear. I know; that fear causes violence might not be such a great discovery. But what is important for me to realize is this: if I want to prevent any violent behavior, or in other words if I want to bring peace or be an instrument of peace, my good intentions are not good enough. Let me say that again. My good intentions are not good enough. You already know what happened to that cockroach. But this cockroach story is just an example. Have you ever been in a situation where you try to remain calm, but regardless of how good your intentions are, you still react with some form of anger hurting even those who you love the most? This means that to prevent violence or to become an instrument of peace, we first need to do the work. We need to work on ourselves. We need to become aware of our unconscious fears, or fear based beliefs, and then work on them to eradicate them from our personality. Where should we start? How can we determine what are these fears? We simply need to look at our violent behaviors. What do we usually do that might cause harm to ourselves or to others? I'm not talking only about physically aggressive behaviors. Maybe some of us struggle with negative thinking and self destructive thoughts. Maybe we deal with resentment, anger or hate. Perhaps we are at times verbally or even physically aggressive with others. Once we are aware of all our violent or harmful behaviors, then we need to figure out what kind of fears trigger these behaviors. Our spiritual journal can become very handy then. We can start to overcome these fears by becoming aware of them, and by realizing that they are nothing but the creation of our own mind. Knowledge can set as free. "How can one be free from fear? What is the way to overcome your fears? Face them and examine them. Most fears are not genuine. When you examine your fears you will come to know that they are not real. If you leave them unexamined, they will grow." ~ Swami Rama: Samādhi, The Highest State of Wisdom. Where do these fears comes from? But why do we have these fears? Many of them we have unconsciously learned from our early childhood. We learned our fears from our parents, family members and society. As small children we learn not what we are taught but what we see others doing. If a little child sees somebody becoming afraid of a cockroach, he or she will immediately learn that behavior. In the same way we've learned to become angry, resentful, verbally or physically aggressive, passive aggressive and so on. All learned behaviors that help us deal with different situations. Becoming conscious of how this deeply-rooted saṁskāras, or mental impressions, affects our behavior, can help us start our journey of transformation and liberation. But going even a bit deeper, what exactly causes these fears? According to the ancient masters, the root cause of all our suffering is avidya, ignorance. Ignorance here doesn't means to be stupid or having no education. Ignorance here refers simply to lack of wisdom. Ignorance means not knowing the difference between what is real and what is unreal, or not knowing what is our true essential nature. Ignorance is simply forgetting who we truly are. This ignorance gives rise to the ego, our obsessive identification to this physical body and mind. The more we identify ourselves with our physical body and mind, the more we separate ourselves from others and the world around us. The more we separate from each other, or the more distance we create between each other, the more afraid we become. That's because we are afraid of whatever threatens our individuality, that sense of self. 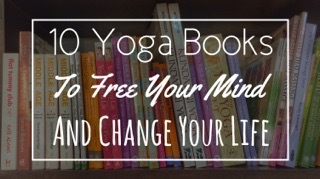 Analyzing the root cause of our fears, that obsessive identification with our body and mind, and realizing that they are nothing but the creation of our own mind, can help us overcome our fears. But to truly attain freedom from all our fears we need to contemplate on, and cultivate, the opposite emotion to fear. That is not courage by the way. Fear separates us from others, so the opposite of fear is that force that unifies and binds. Love removes all differences and all obstacles. It is a force that bring us closer and closer together, and makes us one again. It is love itself what makes us brave or courageous. For love we can cross all oceans and climb the highest mountains. We have all experienced this kind of love. The problem is that our love is usually limited to our family circle and our friends. This is why the enlightened masters tell us: you should learn to expand your love to include all and exclude none. By "all" they refer to all sentient beings. That's the difference between us and the enlightened beings. 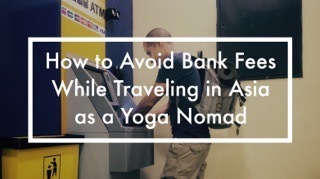 The yogis have no walls or boundaries around them. They see no difference between you, me and them. That's why they are completely fearless. So contemplating on love and expanding our love is the way to attain freedom from all our fears, and we can learn to expand our love by realizing that we are all the same. The masters remind us that regardless of our color, race, social status, cultural background or religion, we all have the same desire to be happy and to avoid suffering. Contemplating on this thought alone can help us remove the walls we build around us, so that we can become closer to one another. Contemplating on ahimsa, non-violence, understanding why it is important and what are its implications, can help us to develop that love as well. Practicing the buddhist meditation of loving kindness can also help us to develop that feeling of love and kindness towards ourselves and others. Contemplating on the ultimate nature of reality, realizing that we are not merely this physical body and mind, can help us develop a sense of unity with all. "As long as you believe you are only a drop of water, you will remain afraid that you will be lost somewhere or absorbed by the earth. When you become the ocean you will no longer be afraid." ~ Swami Rama: Sadhana, The Path to Enlightenment: Volume 2. If we are of devotional temperament we can expand our love by contemplating on God, or whatever name we give to that supreme divine entity. Actually, to contemplate on love is to contemplate on God, and to contemplate on the ultimate nature of reality is to realize that nothing exists but God alone. "If God is everywhere, then He is also in you. If He is in you, why are you afraid? You simply have to realize it." "All fears go away when you realize God exists everywhere. I’m afraid of you or you’re afraid of me because we think we are different from each other. You’re afraid and insecure because you think there is someone apart from you who exists. The teachings say there is only one absolute, indestructible, immeasurable infinite truth without second. The more you remember the one absolute truth that is within and without, your fears will eventually vanish." Who doesn't want world peace? But how many of us are actually willing to do the inner work so that we can truly become an instrument of peace instead of violence? Even if we just want to be able to live in peace and harmony with our loved ones, we still need to do the inner work. We need to study ourselves. We need to know ourselves at all levels and constantly watch our behaviors. This is also part of yoga. This is part of what is called svadhyaya, self study. This inner work is not an easy work though. It is a life long process. Every time we fail we need to get up and try again. I know that all these creatures are part of God's creation. They have the same right as I have to be happy and avoid suffering. Yet when I see a cockroach I still see just a cockroach. Although to be honest, just by writing this blog post and contemplating on these words my perception of a cockroach seems to change a bit. In a very subtle way a cockroach starts looking a little bit less disgusting to my eyes. Imagine how much our perceptions could change with dedicated effort. I hope you've enjoyed reading this blog post. Feel free to share your own thoughts on overcoming our fears and bringing peace to all, in the comment section below. Don't forget to subscribe to by mail here to make sure you won't miss my next update. 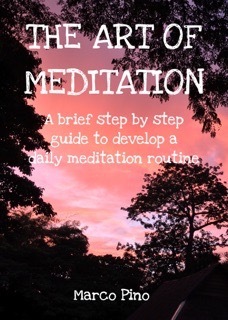 Once you subscribe you'll receive a link to download my free meditation eBook. Thanks for your support.